Have You Seen Conservative Vision? 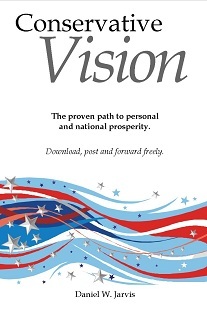 Download your copy of Conservative Vision here. If you’re tired of political wrangling and you’re looking for a real vision of America’s future – and your future – that is worth believing in, check out Conservative Vision! It’s a quick read, but it will change your whole perspective on the elections, on the trajectory of America, on our social and cultural challenges, and the candidates. It concludes with 4 things you can do to help strengthen America. Download, share, re-post, copy – let’s get this message out and let’s re-infuse America with VISION. Conservative Vision opens as a PDF file and you can save it down to your own computer if you like. Then, attach it to an email and forward to your friends, post to your own blog, or link people right back here. No matter how you do it – pass the word on the vision that is larger than policy, larger than politicians, and larger than party affiliation. Or, share this page address on Facebook to spread the vision among your friends and get their opinion. Is this the right way for America? Dan Jarvis, THANK YOU for what you are sharing and doing. I imagine were about the same age. I’m not a highly educated person but I do know the L-rd can use me too. The information you are sharing is greatly needed and appreciated. I appreciate that Ken. I’m trying. I believe if each of us says, “What can I do?” and then we do it – we really can strengthen America.